Changes in climate, biodiversity, deposition of nitrogen, phosphorus and sulphur, and land use are affecting European ecosystems and the services they provide to society. The vulnerability of these services to such changes can now be assessed through modern scientific techniques. a discussion of what a vulnerability assessment, should include, e.g. evaluation of exposure, sensitivity and adaptative capacity. how to involve stakeholders in this process. During the workshop, selected experts presented vulnerability assessment techniques. Six working groups were established to work with a Tutor on a case study. The regions chosen were from Australia, Germany, Sweden, the Netherlands, the United Kingdom and Viet Nam. The international summer school was a two-week course held in the picturesque village of Peyresq. See the photo gallery to get an impression of the site and atmosphere. Here is the list (pdf) with all the participants, tutors and speakers. participants were invited to present a poster on their own research activities in respect of vulnerability on the first two days. an excursion to the Plateau de Valensole, Lac de Ste Croix, Les Salles sur Verdon and the Canyon du Verdon was organised for a full day. practical tutorials took place concentrating on a regional case study. These group reports were submitted to AVEC after the summer school: Australia (pdf: 1MB), Germany (pdf: 500KB), Sweden (pdf: 500KB), the Netherlands (pdf: 900KB), the United Kingdom (pdf: 700KB) and Viet Nam (pdf: 600KB). At the end a questionnaire (pdf) for evaluation of the summer school was distributed. In summary this evaluation (pdf) was very positive for the organizers. The summer school took place in Peyresq in the French Alps (Alpes de Haute-Provence) situated about 1500 m above sea level. The village is managed by the »Fondation Peiresc«, which has assigned the village as a location for scientific and cultural meetings. 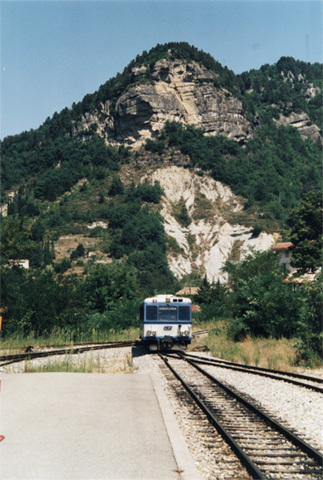 To get to Peyresq by public transport, the easiest method is to fly to Nice International Airport, and then take the picturesque train, called the "Train des Pignes", which goes from Nice through the mountains to Digne, and you have to get off in Annot, where you will usually be met at the station. Note that the Train des Pignes leaves from the "Gare de Provence", which is about 5 minutes walk from the main station in Nice. [Please remember not to get off at a stop called "Peyresq", because this is in the river valley from where you would have to climb an hour uphill to the village!] By car it takes about 1 1/2 hours from Nice.